And this is your bathroom …" As my thakuru, or personal butler, Makif, reaches for the door handle I catch a note of something like pride in his voice. Just as I'm wondering why he's excited about a bathroom he opens the door and in an instant I'm the one who's excited. My "bathroom" is bigger than the rest of my villa, and past the huge freestanding bath a plunge pool is lit up under the night sky. As we step out into the fresh-with-a-sprinkle-of-salt evening air Makif points out that, as well as the rainfall and handheld shower options in the L'Occitane-stocked shower stall, I also have a waterfall shower beside the pool. Not to mention a large inviting day bed in my own lush tropical garden. It may be the middle of the night but since leaving Sydney it's been a long couple of flights and a 30-minute speedboat ride under the stars to get here and as soon as Makif has said goodnight I have a quick waterfall shower rinse and slip into my pool. The next morning I wake with the first rays of light, excited to see those famous Maldives blues for the first time, and discover I don't have to go far. From my bed I can look out over my sundeck past a second small plunge pool and there, framed between the privacy-screen walls of lush plants on either side of my villa, is the sand and the sea. The swimming costume is on in a flash and I'm straight out my front door and into the Indian Ocean, watching the sunrise change the colours in the sky and in the water and feeling like I've woken up on another planet. One of the grand dames of Maldives resorts, Huvafen Fushi has been seducing travellers since it opened in 2004. 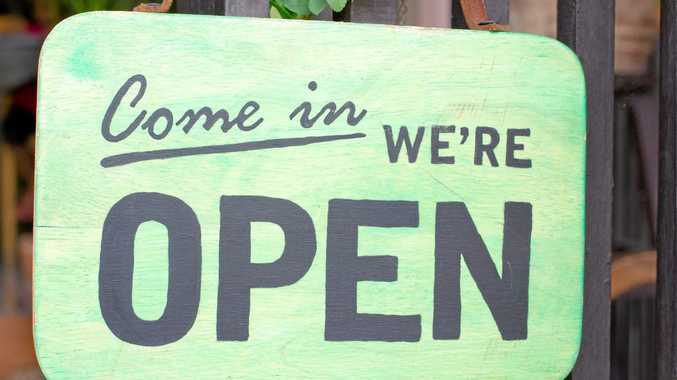 As from January 11, the resort embraced its intimate escape side by only accepting guests 21 years and older. Wildly romantic as the island is, I am also blissfully happy being there solo. Just me and nature. Oh, and great chefs, spa therapists, marine biologists to snorkel with and an attentive thakuru. The island itself is small, a 350m x 100m dot of white sand in the North Male Atoll, and it would take no time at all to explore if I wasn't constantly stopping to take photos and drink in the scene around me. Set within its own lagoon, Huvafen Fushi resort is a naturalist’s wonderland. Picture: Huvafen Fushi. When it's time to drink in something else, the island has the Maldives' first underground wine cellar, which also doubles as an intimate restaurant. Other dining options include the woodfired pizza restaurant, Fogliani's, overwater fine dining at Salt, raw cuisine in an overwater pavilion at Raw, and global dishes at luxe-but-laid-back Celsius, where breakfast is also served. A buffet-free zone, when I can't decide between two breakfast dishes on the menu the waiter encourages me to try both, and as my toes wiggle in the soft sand beneath the table I savour every bite of my "Maldivian" breakfast of chilli tuna salad with fresh grated coconut, fried eggs, steamed rice and warmed chapati, followed by ricotta hot cakes with banana and honeycomb butter. 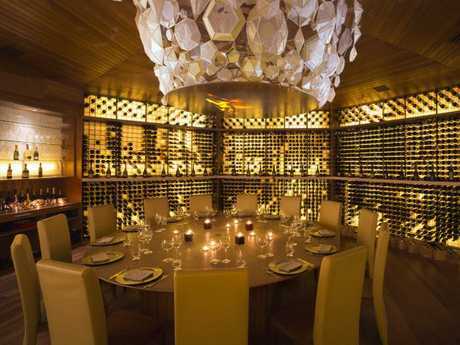 Sample delicious, fresh fare at the Maldives’ first underground wine cellar. Picture: Huvafen Fushi. When it's time to go for my spa treatment, an essential part of resort stays in my book, I go somewhere I've never ventured in a robe. Underwater. At first it looks like one wall of my treatment room is taken up by a stunning aquarium, but after walking six metres down a staircase into the world's first underwater spa, the fish are the ones on the outside looking in. Just as I'm thinking what a shame it is to be face down when those fish are right outside I put my head in the hole on the massage table and see a mirror below, angled just right so I can keep on watching the fish throughout. After some post spa bliss time I have another date with the island's fish, but this time I am covered in sunscreen rather than scented oils. Enjoy being pampered at the world’s first underwater spa. Picture: Huvafen Fushi. At Huvafen Fushi there's no need to get on a boat to go snorkelling. 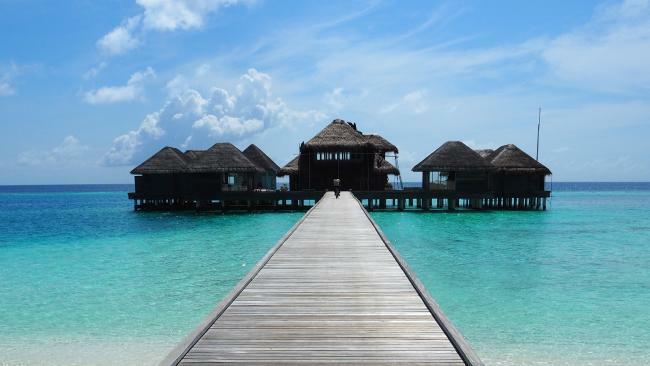 Here I simply follow the island's marine biologist, Hamid, to the far end of the overwater villas, hop into the water and let the current gently move us down the front of the island. The reef was teeming with a seemingly endless variety of fish going about their fishy lives, and as we drifted along I finally saw my first shark, followed by my second, third, fourth and fifth, and Hamid pointed out an octopus that had camouflaged itself so well I would never have seen him on my own. After spotting a hawksbill sea turtle munching away on something between the coral, we made our way over towards it. Then as we floated nearby the turtle moved up towards us, and came so close in that crystal-clear water I could see every pattern on its shell, and watch its eyes moving in its head as we checked each other out before it moved on by. According to the daily activity sheet in my room, there were many other things I could have done at Huvafen Fushi. I could have joined in sunrise yoga in the overwater pavilion, gone scuba diving, parasailing, windsurfing or kite surfing. I could have paddled along by kayak or paddleboard, or zipped along by waterski, wakeboard or kneeboard. But Huvafen Fushi means "dream island" and for me the dream was to simply be there, breathing in that frangipani-fragranced air, looking out at those Maldives blues and thinking "how's the serenity?" There’s plenty of aquatic fun to be had at Huvafen Fushi. Picture: Huvafen Fushi. Singapore Airlines and Singapore Airlines' regional wing Silk Air both fly to Male daily. Upon arrival at the international airport a Huvafen Fushi representative guides you to a waiting speedboat outside and it's then a 30-minute journey to the resort. 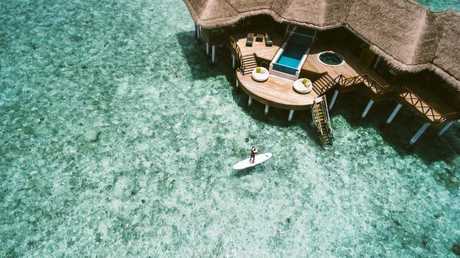 Huvafen Fushi has 40 beach and overwater bungalows and villas, each with private pools, plus three two-bedroom residences and one three-bedroom residence. Guests can also sleep on a dhoni, a 65-foot traditional Maldivian sailboat that can be booked in conjunction with any room type. 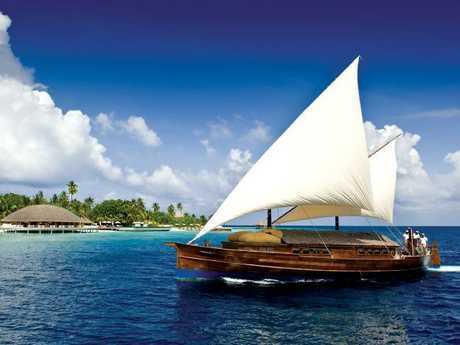 Huvafen Fushi resort is only a short 30-minute speedboat ride away. Picture: Huvafen Fushi.